A CAS card from me today. I found the colours in the Play Date Challenge 'challenging' but fun to work with. The photo is a bit dark unfortunately, I had a few issues with the camera, wish I had somewhere to put the light box I bought a while back. There is literally no room in this house to set it up properly. Might have to sort something out in the garage.....these dark winter days are a killer for photos. I am also going to put this in the Moxie Fab World 'Congrats' Challenge. wow this is gorgeous...love your embossing.. Thanks for playing with us at The Play Date Cafe!!! Gorgeous card! Love the embossing and the ribbon! Thanks for playing this week at The Play Date Cafe. 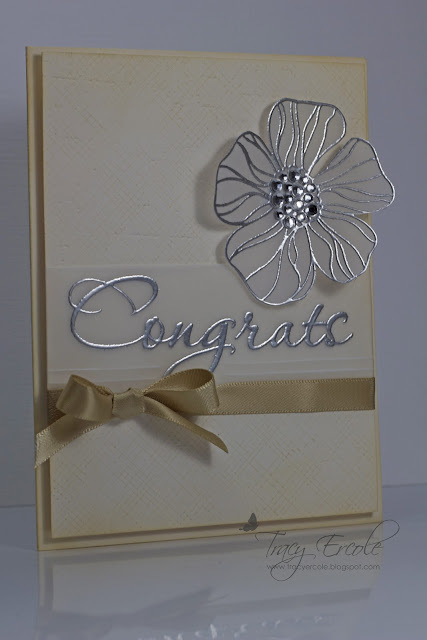 I just love, love, LOVE the way silver embossing powder looks paired with vellum! This is ever so pretty, Tracy! Thanks so much for playing along with us this week at The Play Date Cafe! What a stunning card! I LOVE everything about it! 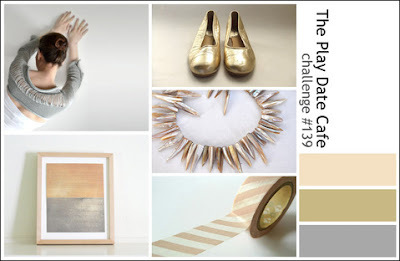 Thank you so much for joining us over at The Play Date Cafe this week! Congratulations on your PDCC shout-out! Your card is breathtaking, and pinned!! LOVE your CAS card, Tracey!! Congrats on the Honorable Mention over Moxie Fab World! The silver ep is so elegant! Congrats on your MFW win!